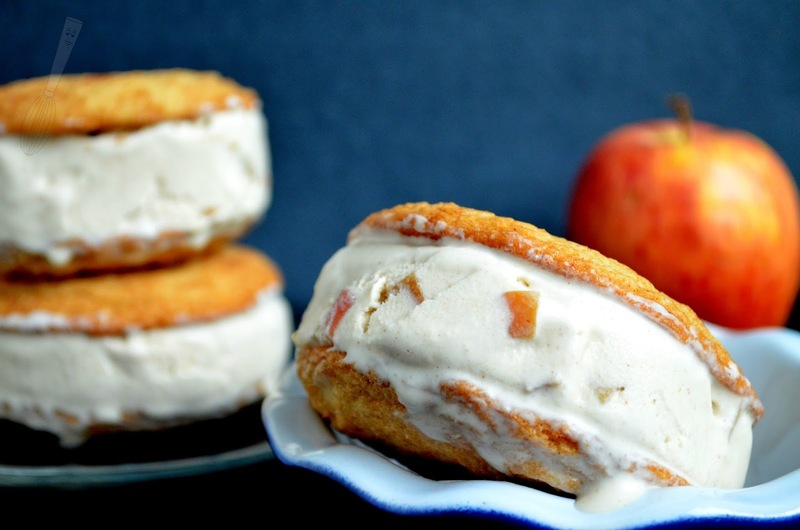 We are getting into apple season and these Apple Pie Ice Cream Sandwiches are a perfect treat while it's still warm outside but you're ready for an autumn flavored dessert. 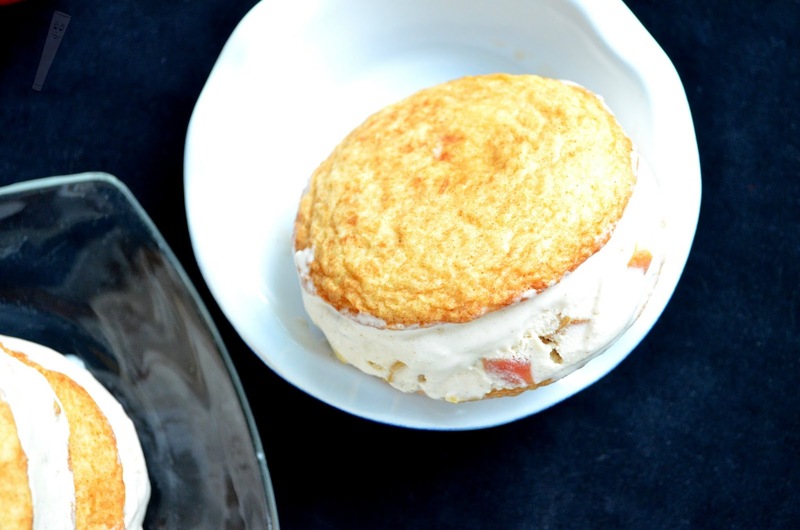 The sandwiches are made with snickerdoodle cookies encasing creamy homemade apple pie ice cream dotted with fresh cinnamon apples and a little brown sugar. If you don't have an ice cream maker, that's okay, I will suggest some other ways to make this recipe a little easier (and quicker if you need to save some time). I know that the recipe for these looks long but don't be alarmed by them. It can be done in steps over the course of one or two days or you can use short cuts! If you are able to make all of it from scratch it is a delicious result though. Creamy ice cream dotted with cinnamon flavored apple pieces in between cinnamon-sugar coated cookies. There are other ways though, if you're short on time of course. You could always pick up some premade sugar cookie dough (like the place and bake) and roll them in cinnamon-sugar and bake them as directed. You could also use premade vanilla ice cream (if you don't have an ice cream maker). Just soften it on the counter for 20 or 30 minutes, and mix in the apples, light brown sugar, and cinnamon. If you want to you could even mix in some broken up graham cracker pieces. (I thought about rolling the ice cream sandwiches in crushed graham crackers but since I didn't have any I decided against it :) ). Put it back into the container or another container and freeze until it's firm enough to hold it's shape. I suppose I could have made the recipe using premade dough and a purchased vanilla ice cream base but I'm always a go-getter when it comes to recipes. I'm the crazy person who makes gnocchi on a whim on a thursday night or french bread for fun on a saturday afternoon. This recipe makes 6 really big sandwiches but you can also make smaller cookies if you want a larger yield or smaller hands will be eating them :). If you have any questions feel free to comment or e-mail me. Happy baking! 1. Prepare the ice cream: In a medium saucepan, heat the milk, ½ cup brown sugar, ¼ cup granulated sugar, and 2 ¼ cups heavy cream until bubbles form just around the edges, stirring frequently. 2. In a small bowl, whisk the egg lightly. Slowly add about a ¼ cup of the milk mixture to the egg, whisking constantly. Add the egg mixture back into the milk mixture in the pan and stir. Stir in the vanilla and cinnamon. Pour through a fine sieve into a bowl (to strain out any cooked egg). Chill at least 1 hour. 3. Melt 1 ½ teaspoons butter in a small skillet. Stir in 1 ½ teaspoons sugar and ¼ teaspoon cinnamon. Stir in the apple and cook for 8-10 minutes or until light brown and softened. Set aside to cool. 4. Prepare the cookies: Preheat oven to 375F. In a mixer cream together the butter and sugars until light and fluffy, 1-2 minutes. Scrape bowl. Add egg and vanilla. Mix until blended, scrape bowl. 5. Add the flour, cream of tartar, baking soda, and salt. Mix on low speed until combined. The dough will be a little soft, refrigerate for 20-30 minutes. 6. In a small bowl combine 2 tablespoons sugar and 1 teaspoon cinnamon. Scoop the dough into about 2 tablespoon-sized balls and roll in the cinnamon-sugar mixture. Place balls of dough on a cookie sheet. Bake 9-10 minutes or until set around the edges and tops are light brown. Cool for a few minutes on the sheet pan then remove to cooling rack. 7. Prepare ice cream in an ice cream maker according to manufacturer’s direction. Once the ice cream starts to firm up (4-5 minutes before it’s done), add the diced apple to the machine. 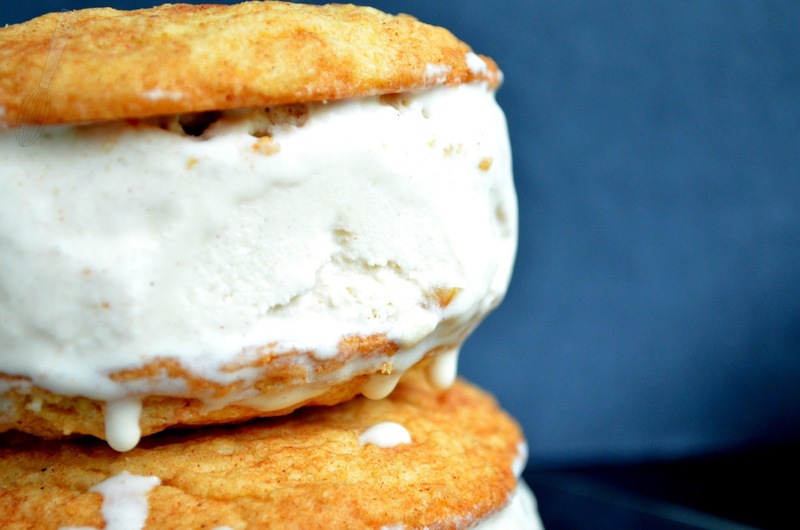 Chill the ice cream for 3-4 hours or until firm enough to scoop and hold it’s shape when scooped onto an ice cream sandwich between two snickerdoodles.